Humanizing the candidate experience is important because what’s on the inside shows up on the outside. Your attitude and care with candidates is their decoder ring to what’s to come as an employee. 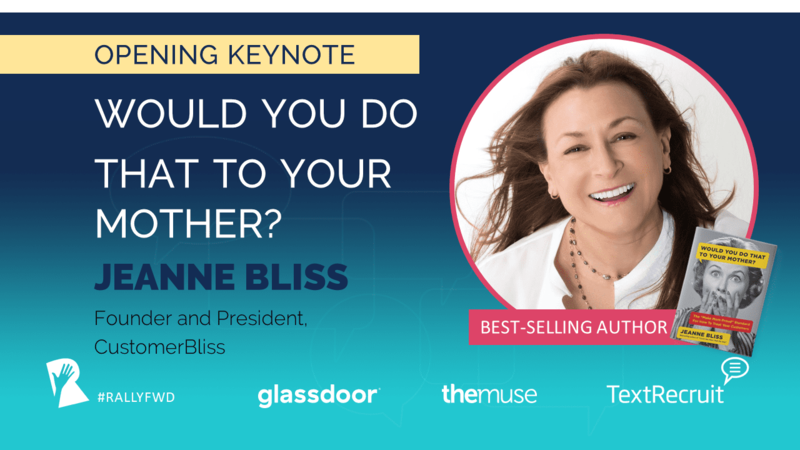 Jeanne Bliss is the Founder and President of CustomerBliss, and the Co-Founder of The Customer Experience Professionals Association. Jeanne is one of the foremost experts on customer-centric leadership, having pioneered the role of Chief Customer Officer at Lands’ End, Microsoft, Coldwell Banker and Allstate. Reporting to each company’s CEO, she moved the customer to the strategic agenda, redirecting priorities to create transformational changes to each brand’s customer experience. She has driven achievement of 95 percent loyalty rates, improving customer experiences across 50,000-person organizations. Jeanne is a sought-after speaker on employee and customer experience, and author of three best-selling books: “Chief Customer Officer” (Jossey-Bass, 2006), “I Love You More than My Dog: Five Decisions that Drive Extreme Customer Loyalty in Good Times and Bad” (Portfolio, 2001), and “Chief Customer Officer 2.0” (Wiley, 2015). Her latest release is, “Would You Do That to Your Mother?” (Penguin/Portfolio). Go to https://www.make-mom-proud.com to post your mom’s picture and how you make her proud in business.